We are honored that Bellefield’s iTimeKeep has been recognized by the ILTA community as the most adopted mobile time entry solution in legal for the third consecutive year. 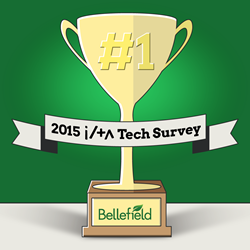 Bellefield Systems, LLC, the leader in mobile and anywhere time entry solutions for firms of all sizes, announced that its flagship product, iTimeKeep has been recognized in the 2015 ILTA Technology Survey as the #1 most adopted mobile time entry solution among attorneys. This is the third consecutive year that iTimeKeep has earned this designation. The annual technology survey, published by ILTA (International Legal Technology Association) reflects the input of over 400 law firms representing more than 106,000 attorneys and 217,000 total users. This year’s survey indicated that mobile time entry is continuing to increase in popularity in today’s law firms, with a 12% increase in adoption compared to last year. Adoption of iTimeKeep increased significantly, growing by 50% – a growth rate that exceeds its competitors in the market. iTimeKeep, selected by 25% of the firms in 2015 according to the ILTA survey, has become the clear leader in mobile time entry in the legal market due to its unique approach to mobility, which utilizes TEaaS (Time Entry as a Service) model, which Bellefield pioneered. Furthermore, Bellefield maintains an aggressive release schedule, which allows for the development of first-of-its-kind innovations, such as the Bellefield Engagement Program and the industry’s first timekeeping app for the Apple Watch. As law firms continue to strive for True Mobility and increasingly embrace wearables, Bellefield remains committed to continual innovation in order to provide today’s law firms with tomorrow’s solutions.